IT'S HARD for Shaina Kauhi to keep her keiki, ages 7 and 9, from trying to discover what's in their Christmas packages. "They touch and poke at the packages trying to figure out what they are getting," Kauhi said. But this year, Kauhi borrowed a tip from customers at the American Self Storage facility on South Street where she works and is using a storage unit as a makeshift Santa's closet. It's not uncommon in Hawaii or nationwide to see storage units used to house holiday presents, especially big items like televisions and bikes that are hard to hide. 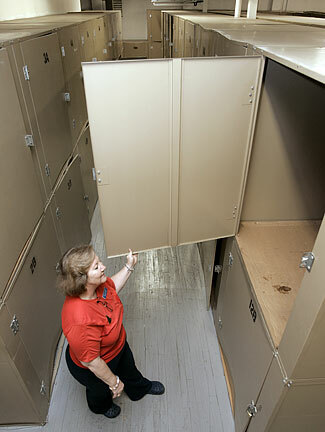 Jane Davies, manager of Abbott Self-Storage in Nashville, Tenn., yesterday showed one of the 4-by-4-foot storage units marketed as "Santa Closets." The Santa's closet concept is all part of the growing market enjoyed by the storage unit industry, which has nearly doubled in size over the past decade. There are more than 40,000 storage facilities nationwide, and one in every 11 households rents a self-storage unit compared to one in 17 in 1995. Self-storage facility gross revenue for 2005 was about $18.5 billion, according to the Virginia-based Self Storage Association. 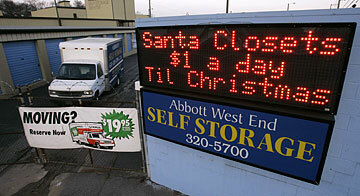 Mike Scanlon, president of the Self Storage Association, said there is a bump in business around the holiday season. "There are not many places to hide that stuff around the house if it's a bike or some kind of sporting good item, things you just can't hide in the back of a closet," Scanlon said. While it's hard to say how many people or businesses in Hawaii have caught on to the quest for holiday storage, at least one local facility has seen an uptick in short-term rental requests. "We've had more people asking for one- and two-week rentals," said Ema Abregano, the office manager at Hy-Pac Self Storage LLC's facility on Nimitz Highway. While Hy-Pac only rents by the month, Abregano said some people have rented the space anyway, and she's seen lots of old customers filling their storage space with holiday items. A sign outside the facility advertises the spaces for rent to stash big gift items like televisions or bicycles. "I've seen them come in with bikes and larger presents," she said. Leota Wicks, general manager of StorSecure Self-Storage in Hawaii Kai, said using storage facilities to hide presents is not uncommon in Hawaii. "My husband and I have been in this business for 15 years and we've definitely seen people do that," Wicks said. One year, a customer even forgot they had put their presents in storage until the big day arrived, she said. Wicks opened the business on Christmas Day for the customer. "We were closed, but we let them in," she said. "We wouldn't want anyone to be without presents at Christmas." While Ala Moana Self Storage on Kamakee Street hasn't had many holiday rentals, the facility likely will market to that crowd next year, Manager Pat Stokes said. "I haven't had many short-term rentals this holiday, but I know that people definitely do this on the mainland," said Stokes, who just moved to Hawaii from Dallas. Using self-storage for holiday stuff is so popular on the mainland that many storage facilities target seasonal advertisements to this market, she said. "It's a great idea to put your presents in a safe place where they are locked up and can't nobody find them," she said. Next year, Stokes said she'll advertise the Santa's closet concept in Hawaii with the idea that it could be the gift that keeps on giving for her business. "Storage places that advertise to the holiday crowd generally end up with more business because the customers get used to the space and extend their short-term rentals," she said.